﻿Wiltech offer a range of screens for indoor and outdoor use. Our large screen is 9m x 5m. Projection is via a 6,000 Ansi Lumen projector. With a PA System adequate for up to 8,000 people. This screen comes with a stage that protrudes in front of the screen 2.4m (depth) x 6m (length). Making it ideal for pre screening performances. Wiltech have 10 years experience in outdoor projections. 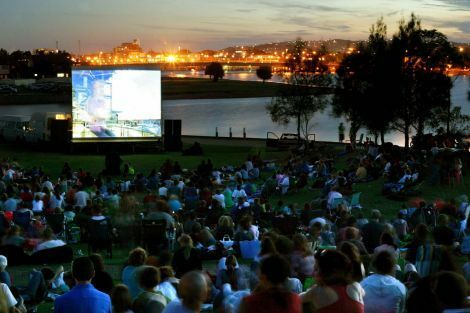 Including local business, universities and schools outdoor cinemas. Wiltech service Newcastle, Lake Macquarie, ﻿Sydney, The Central Coast and the Hunter Valley﻿.